Dirty dishes cost you money, and lots of it! When the dishes are piled in the sink and on the bench, it is much harder to put a meal on the table. The thought of doing the washing up first takes away the desire to cook a meal. You would really like to cook dinner yourself, except you can't, because the sink is full and you don't have any clean dishes! And you know that ordering dinner will cost double or even triple what it would if you were to prepare and cook the meal. Get into the habit of washing up at least once a day. It's easy, trust me. And it doesn't take that long either - 15 minutes at the most, even for the largest of families. You can do anything for 15 minutes, even dishes. Ok I admit defeat - you can't hold your breathe for fifteen minutes, but you know what I mean. 1. Have the compost bucket and the rubbish bag handy. 2. Clear the table and immediately scrape the plates - put the compostable scraps in the compost bin, the rubbish in the rubbish bag. 3. Stack the plates next to the sink: dinner plates, bread and butter plates, bowls. Collect the glasses and cups and stack them next to the plates. Pile the cutlery together. 4. Turn on the hot tap and give the sink a very quick swipe (you don't want to wash dishes in a dirty sink. 5. Put in the plug, add a squirt of detergent and half fill the sink with hot water. Add cold water until it is bearable for you to put your hands in (or skip the cold water and wear rubber gloves). 6. If you have a double sink, half fill it with hot water. 7. Dump the cutlery in the sink and wash. Place it in the clean water to rinse, remove and let it drain on the side of the sink. 8. Wash the glasses and mugs, rinse and let drain. 9. Bowls and side plates are next. 11. By now the cutlery should have drained and be almost dry - polish it with a clean tea towel and put it away. Then do the bread and butter plates and bowls, followed by the dinner plates. Leave the glasses and mugs until last and they should just need a very light polish with the tea towel. 12. Wash up the pots and pans, dry them and put them away. The dishes are done and in fifteen minutes! If you have someone to help you with the drying and putting away it might only take you ten! So you can leave your kitchen spotless, wipe over the benches and clean the sink. Sweep the floor. Take the compost to the compost bin and the rubbish to the rubbish bin. Now stand back and bask in the glory that is a clean kitchen, and all done in just fifteen minutes! I think it's amazing that people should need such basic advice...but it's true they do! What I liked about this article is that it actually told you to RINSE the dishes. I have had very heated arguments with people who wash their dishes, glasses, cups and cutlery in hot soapy water and just drain them in the drainer and then go out and spend a fortune on organic food!!! At least the sprays and additives in the food have been approved to be "eaten"! Dish washing liquid is not. I would definitely wash the GLASSWARE FIRST followed by cups mugs saucers (all the less "dirty" dishes) followed by pots and pans used for steaming veggies (ie non greasy) then cutlery dinner plates (soup bowls etc) and then greasy cookware. AND YES, definitely RINSE before stacking in dishrack to drain - I like to let them drain and then polish with cotton or linen teatowel - pots and pans with ordinary tea towels. 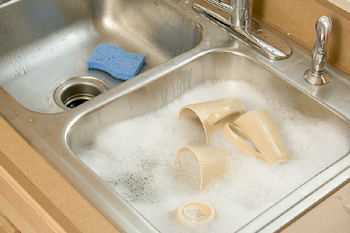 Stacked away - wipe down the sink and draining boards and dish rack pop everything away - and the sink will shine. Glassware and mugs are next because they can be greasy too, but not as messy as dinner plates. By the way, does everyone know that you should always rinse glassware, mugs, jugs and baby bottles that have had milk or cream in them in cold water before washing? If you rinse in hot water or just put them straight into the hot water to wash, the fat from the milk will smear. Rinse in cold water, the fat congeals and is rinsed out - even if you can't see it, it is there. Get into the habit of washing up at least once a day? am i not normal? also agree with anon.. I think it's amazing that people should need such basic advice! Step 11 is drying up - not washing. For those readers that got confused. I agree with Cath's post. Sometimes when you're home alone it can be easy to leave the breakfast & lunch dishes 'cos there don't seem many. But it's easier to start cooking the evening meal if all the dishes are done ! Winny. Yes ....saves a bad scenario at the end of the day. Its easy to be busy through the day when alone and suddenly find its built up just when you need to begin cooking ! To lessen the washing up after a meal, while I am cooking I try to wash up the things I use as I go. I have a double sink so I half fill the small sink with hot water and a squirt of dish washing liquid-economises on hot water. This is good for washing knives etc. between uses on different ingredients when I'm cooking. It's also hygienic.